This evening I got distracted and, instead of writing my usual Nurturing Thursday post, I put on my pajamas and chatted with my husband for a while. Then I got in bed and was still awake, looking at the brightness behind the window shades where light was reflecting from snow, and had a vague sense that there was something left undone. The internal to-do list never fully came back after its mysterious disappearance over the holidays, it seems. I did eventually remember that it was Thursday and I hadn’t written a blog post, so I got back out of bed and sat down at the computer. 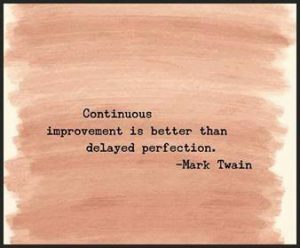 Oh well, nobody’s perfect, and anyway, Nurturing Thursday is about gradual self-improvement rather than getting it right every time. Better later than never! Great message my dear!